1645 – John Milton published Tetrachordon: Expositions upon the four chief Places in Scripture which treat of Marriage, or Nullities in Marriage, his fourth subject on the subject of the legitimacy of divorce. 1675 – John Bunyan was imprisoned for preaching without a license. In the years after the Restoration, the Anglican ecclesiastical authorities cracked down on dissenter preachers. 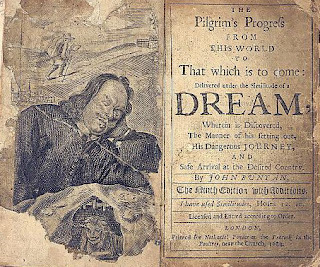 In his imprisonment, he wrote Pilgrim’s Progress, one of the spiritual classics of the 17th century. In Huckleberry Finn, when Huck was staying at the Graingerford’s, he started reading this book, which he found in their library. Huck says it was about a man who left his wife and family and went on a long trip. Huck says he could never figure out quite why. 1848 – George Sand and her lover, composer Frederic Chopin meet for the last time. They had been estranged for some years, after living together for 9 years. Sand’s daughter Solange had driven them apart with malicious gossip. 1877 – The ballet Swan Lake was performed by the Russian Imperial Ballet in Moscow. 1880 – New York Daily Graphic publishes the first half-tone engraving. 1885 – Gilbert & Sullivan’s opera The Mikado premieres in London. 1887 – 23-year-old William Randolph Hearst buys the San Francisco Examiner, and starts to build the Hearst newspaper empire. He accomplished this with a rare combination of pretty good reporting and lurid sensationalism. 1921 – E. M. Forster sets out on a passage to India to assume his duties as secretary to the Maharaja of Dewas Senior. 1928 – British writer , in Nottingham. 1934 – Edmund Wilson, American literary commentator, wrote Gertrude Stein to tell her that her libretto for the opera Four Saints in Three Acts was the best dramatic production of the season. 1952 – Ernest Hemingway completes his short novel The Old Man and the Sea.